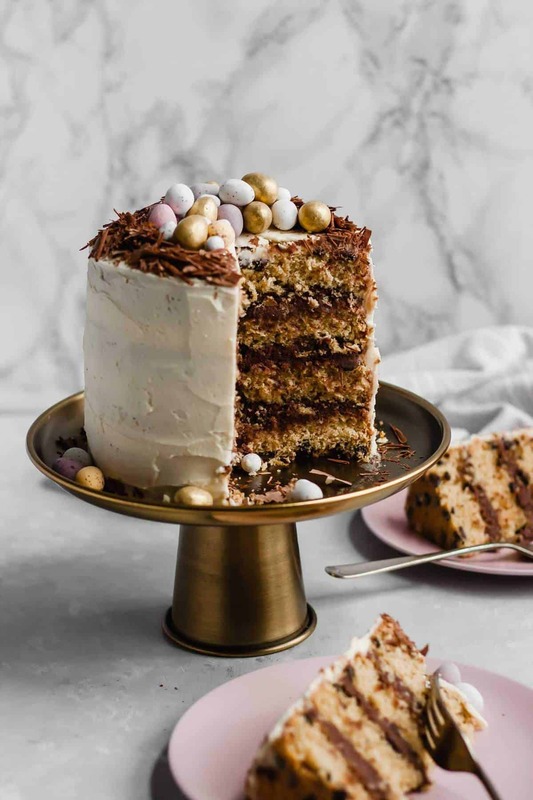 This Brown Butter Chocolate Chip Easter Nest Cake consists of a delicious brown butter sponge, chocolate chips and brown butter frosting topped off with a chocolate Easter egg nest. 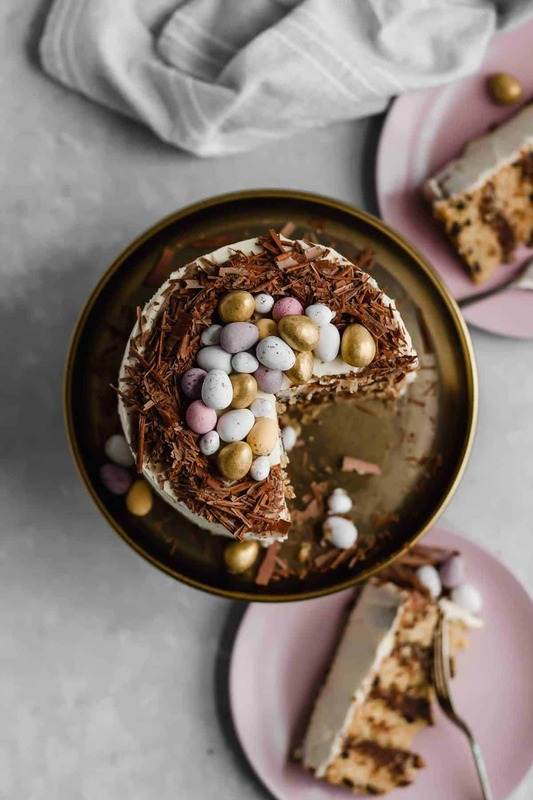 It’s the perfect indulgent Easter dessert! Happy first day of Spring! Oh my goodness, I don’t know about you but I’m ready. I’m so ready. It’s been a tough old winter and I’m just ready for it to be over. And it is! Technically. It’s still pretty chilly out there but at least the snow has thawed now. And I’m hoping we don’t have any more. The crocuses are out and the first blossoms are peeking from the still bare trees. Everything is slowly coming back to life. The mornings and evenings are getting lighter. The thought that my favourite months are just around the corner fills me with joy. Eep! And what better way do I know how to celebrate than with a big indulgent cake?! There is no better way! And there’s so much chocolate around at this time of year anyway, we might as well make good use of it, no? I’m a sucker for mini chocolate eggs so I knew they had to feature somehow. I’ve had the idea in my head for weeks and weeks to make a really simple cake with a chocolate nest on top so I knew I had to make it happen. But for ages I didn’t know what flavour cake to go for. I didn’t know whether to go the chocolate route or vibrant fruity route like I did last year with this Blueberry Passionfruit Layer Cake. Yeah. Chocolate won. And brown butter – lots of it. Trust me, you need to try this. The brown butter adds so much flavour to the cake! And chocolate chips too because why not? And two types of brown butter frosting. Are you drooling yet? Let me break it down for you. 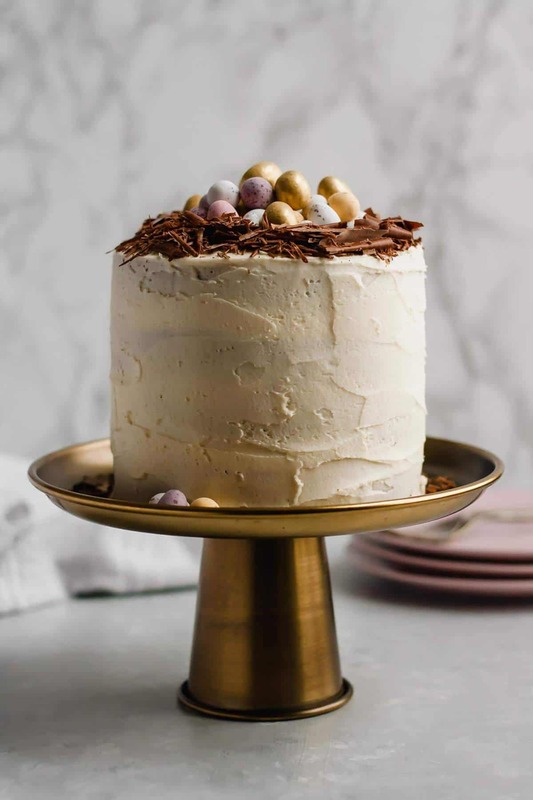 Brown Butter Chocolate Chip Easter Nest Cake. 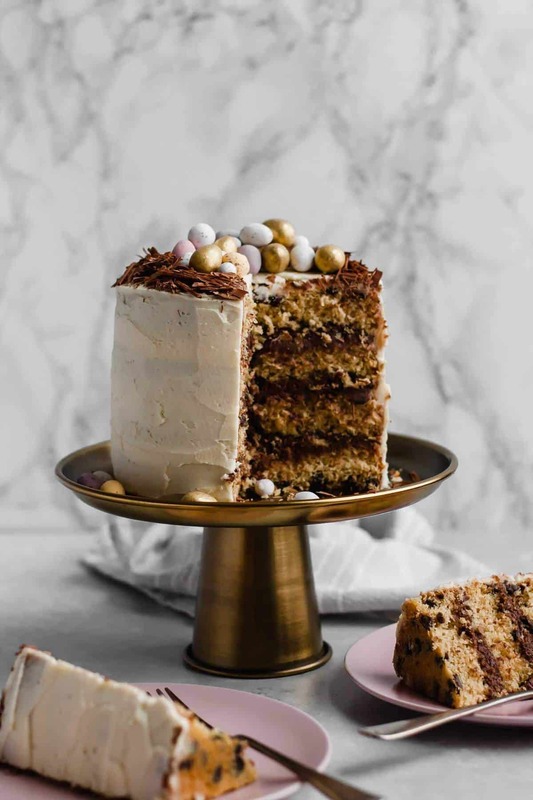 4 layers of brown butter sponge studded with dark chocolate (or your choice of chocolate!) chips. Sandwiched together with brown butter chocolate frosting. Coated in even more brown butter frosting. Topped with a dark chocolate shavings ‘nest’ and as many chocolate eggs as you can squeeze in there. Have I convinced you it’s a good idea yet? You know it needs to happen! Begin by making brown butter. You need to complete this step ahead of time as the cake recipe requires room temperature butter. Cut the butter into slices and place in a large saucepan. Melt the butter over a medium heat. Once melted, keep heating the butter, whisking frequently to keep the milk solids moving, until the milk solids start to brown. This can take a while, 10-15 minutes, but you don't want to rush it by turning the heat up too high as it can soon go from browned to seriously burnt. When the butter starts to froth, you know you're getting somewhere. The brown butter is ready once you have reddish-brown bits at the bottom of the pan and it smells wonderfully nutty. Remove from the heat and transfer to a heatproof bowl immediately. Leave to cool for a while then transfer to the fridge to set (or freezer if you're in a rush). Preheat oven to 180C/160C fan/350F. Lightly grease and line 2 6" loose-bottomed baking tins (or 4 if you have them). Place your room temperature brown butter in the bowl of your stand mixer (or use a large mixing bowl and a hand mixer). Add the sugar and cream together with the paddle attachment for a few minutes until pale and fluffy. Crack in the eggs one at a time, adding a tablespoon of the flour mixture with each one to prevent curdling, beating well for a minute or two between each egg. Add all but one tablespoon of the flour to the butter/egg mixture. With the mixer on low, slowly mix in the flour until combined. Pour in the milk and vanilla extract and mix gently until combined. Do not overbeat the mixture. Toss the chocolate chips with the remaining flour and then gently fold these into the batter. Divide the batter evenly between the 2 (or 4) tins. If using 2 tins, keep the other half of the batter at room temperature until the other cakes have come out of the tins. Place in the oven and bake for about 20 minutes until golden and an inserted skewer comes out clean. Leave to cool in the tins for 5 minutes before turning out onto a cooling rack to cool completely. Repeat for the remaining batter if you have it. Place the butter in the bowl of your stand mixer with the paddle attachment (or in a mixing bowl and use a hand mixer). Add half of the icing sugar and beat well for a few minutes until well combined. Add the remaining icing sugar, vanilla and salt and keep beating for several minutes until it's pale and fluffy. Add a tablespoon or two of milk and beat until the buttercream reaches your desired consistency - you want it to be spreadable but not too soft. Melt the chocolate in a heatproof bowl set over a pan of simmering water (or in the microwave if you prefer). Split the frosting in half. Put one half in a separate bowl and keep the other half in the bowl of your mixer. Pour in the chocolate and the cocoa powder and beat until smooth. Add some more milk if needed. 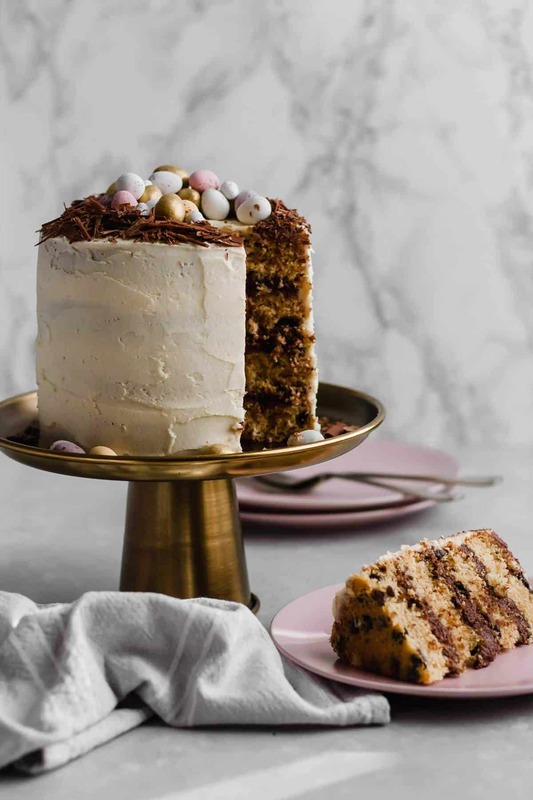 Place one of the cakes onto a plate or cake stand. Spread with chocolate frosting. Repeat with the remaining cakes/chocolate frosting. 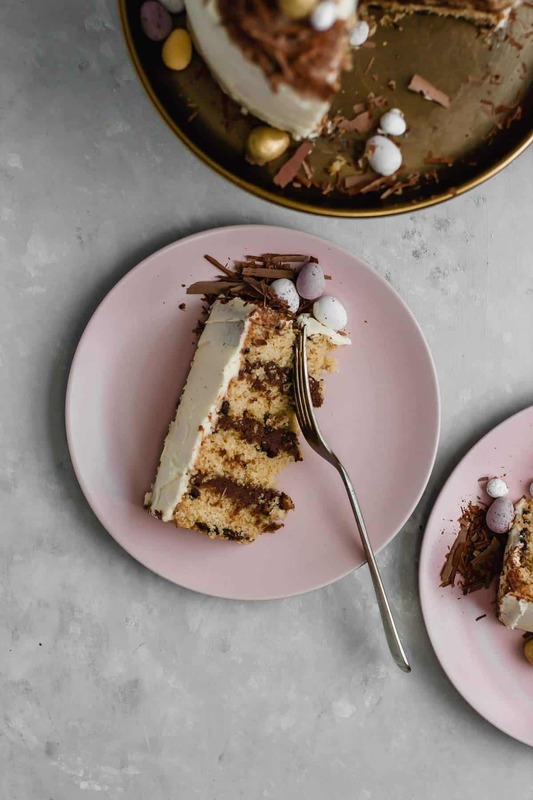 Using a palette knife, spread the top and sides of the cake with the plain brown butter frosting. To make the chocolate curls for the nest, take a bar of dark chocolate and a sharp knife. Carefully pull the knife over the surface of the chocolate towards you to make curls. Carefully pick them up using the knife and place them around the outside of the cake to form the nest. 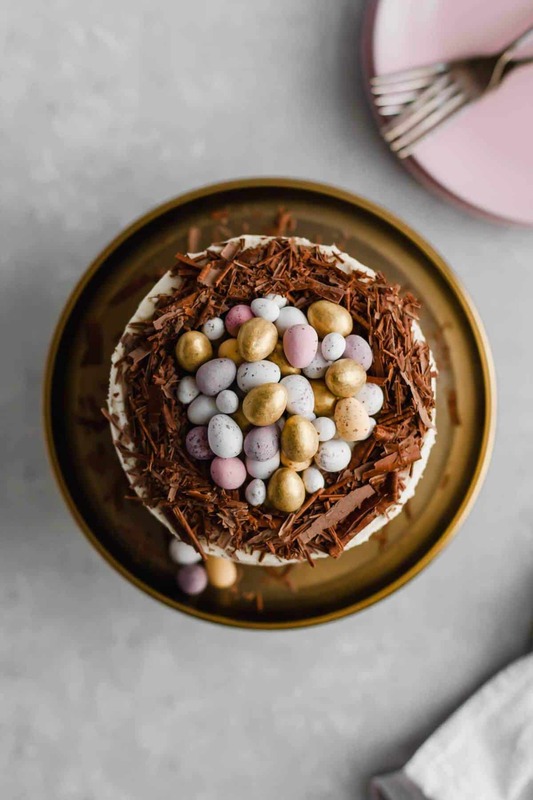 Fill the inside of the nest with chocolate eggs of your choice. Dig in and enjoy! I like to brown the butter the night before and then remove the it from the fridge in the morning so that it can come up to room temperature before I bake. You'll have more than you need but the butter does decrease in volume as it browns so it's easiest to start off with extra to make sure you have enough! Just use the leftovers anywhere you might use butter! The chocolate chips might sink to the bottom of your cakes but it's no big deal and will still be delicious! Tossing the chips in flour helps to reduce this but those chocolate chips will go wherever they like! I love that you paired a nutty brown butter with chocolate chips! Super gorgeous cake, perfect for impressing people! Thanks so much Marlee! Brown butter and chocolate chips are an epic combo, so delish! What size tin do you use?